Of all the characters that have graced the shelves of grocery stores and newsstands the world over, none captured the feel of the post-bellum South so much as The Reverend. 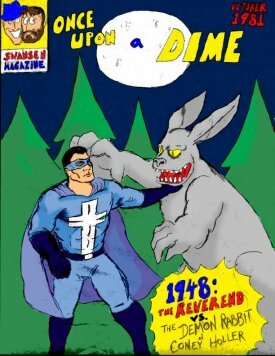 From the cross that lit up on his chest when evil approached, to the eyes of the demons that he battled tooth and nail, The Reverend’s seven-year run made him a favorite of children around the country, but especially those who read beneath the covers in former Georgia plantation homes. Returning as the main feature in Fighting Tales #17, The Reverend accompanied a young Atlanta man across the ocean in his battle against Uncle Fritz, saving him and several of his platoon mates from heavy fire at the hands of the Germans, before performing a mass baptism that made the Gerries lay down their arms. No issue of any wartime comic had approached the sales level of Fighting Tales #17, and it served as the catalyst to turn The Reverend into the star of American Victory comics. American Victory had been a low-selling title featuring the adventures of Mr. Excelsior, the Harvard professor turned crime fighter who would make daily flights to Europe or Japan to save our boys. Once the jump-suited and masked Reverend replaced the aging academic as the star, sales jumped greatly, particularly in the South, where The Reverend spent most of his time routing out draft dodgers and stopping Germans from infiltrating the social set. The Reverend rarely handed out true beatings, usually preferring to give wrongdoers a second chance at redemption. The Reverend, the alter ego of Bible publishing tycoon James Strong, had powers that allowed him to serve both his Southern brethren and the effort abroad. Immune to the bullets fired by the foreign menaces then at war with the U.S., The Reverend could call forth his Armor of God to take the heavy fire. His early adventures frequently took him over-seas, trips aided by his powers of flight and super-vision. He could call forth his cross to show the light of truth to any non-believer. One of his frequently used powers, “Absolution,” allowed many villains to be forgiven, often breaking into tears and taking holy orders in the next frame. His greatest power, Hanland claimed, was his compassionate wisdom that allowed him to bring people together. Hanland wrote just nine issues of American Victory before an actual American victory was secured. Hanland, along with Dirk Morris and Stuart Jeallia, launched a new imprint, JHM. The first JHM series to hit the shelves was Tales of the South, the first book where The Reverend starred as the featured character away from the war. There he specialized in saving Georgia and Alabama from villainous attacks, which always allowed him to spread a special message on the final page. For Tales of the South, Hanland created a rotating series of characters to join The Reverend; including Colonel Sharp, Master of the Buckknife, Southern Belle, a gracious and powerful young thing who fought crime using her superior manners, and Dr. Hound, a kennel operator who could call forth any hound to do battle with him. These characters were opposed by villains who seemed more than a little inspired by those in other, more successful books: the Walking Explosion, Alligatorman, the Miniature Menace, and the Bard. When writs arrived at JHM from the larger companies, Hanland’s partners forced him to scrap most of his villains, instead bringing in new terror groups, such as the Carnies, a group of hucksters and confidence men that first appeared in late 1947. By this time, the cast of characters that Tales of the South featured had grown a bit stale, and the storytelling that had once propelled the book into the hands of many young boys had fallen flat. Hanland spun off Dr. Hound to his own book, and sold the rights to Colonel Sharp to Jay Mutille, his longtime friend and inker. Tales of the South was renamed The Reverend, but protests from various groups encouraged them to re-title the book The Southern Defender, a name which held for the rest of the run of the series. In issue #29, The Reverend had a major makeover, one that had been forced on Hanland by his JHM partners. After years of fighting standard villains, The Reverend started battling demons, devils, and all manner of Satan’s ghouls. 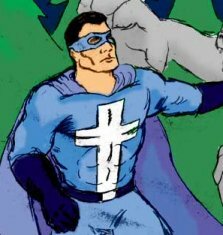 In these stories, he was no longer a mere religiously themed, Southern superhero, but the only defense between a cherished way of life and pure evil. These books became darker, with Hanland working in more “proud Southern heritage” as a backdrop for the supernatural events. Even though many believed that Hanland opposed the changes, he attained a new level of creativity. “I can remember an issue where a man named Justice helped The Reverend find a group of wandering Northern vampires called the Carpetbaggers,” long time comics commentator James “Wizard” Reel recalled. By 1951, Hanland stood as a true visionary, always coming up with new turns to keep his stories fresh. Once, The Reverend was called to stop a duel between two noble young men. He made it in time, but was quickly confused with how to handle the situation once he realized that each man was fighting for a different church. As the two men turned, The Reverend stepped into the path of both bullets, allowing them to harmless bounce off his Armor of God, then brought the congregations together to celebrate Easter at the Mansion built over his secret base of operations. Hanland suffered a massive heart attack and turned the reigns of the series over to his 18-year old son, Michael Hanland. Almost instantly the younger Hanland ran into trouble with the Comics Code Authority due to gory fights between The Reverend and zombies, Michael’s favorite monsters. After learning of the troubles, father Hanland returned instantly, drawing his comics from his South Philadelphia hospital bed. These issues, numbered 47-51, featured The Reverend setting things right with ill people in the moments before they would be attacked by the forces of evil. His roommates during his stay provided much of the inspiration for these stories, and the ghost of a supposed Civil War General who had spent his final days in the halls of the hospital made an appearance as a helpful spirit, giving The Reverend hope when all else failed. Hanland soon spun off the General character into his own book, General Ghost, in which the great soldier led modern armies out on the field. With the rise of Communism, Hanland returned to his former methods during the war, bringing in a group of communist demons called The Workers. The Workers would sweep into a house and take all the sacred heirlooms, leaving the house gray and lifeless. In one issue, they went so far as to swarm the occupants, and change them from their perfectly manicured attire to the drab clothing the beasts favored. After several issues of battling the crew, The Reverend finally trapped the Workers in a small cubicle and sent them back to Ivan in Moscow. Neenan took up the pen from issue 72 and continued until the series final issue. Jacob introduced The Kentuckian, a brash man of great mustache and strong musketry skills. The Kentuckian made a habit of disrupting galas, riding his fiery horses into stately homes and spitting tobacco juice onto the satin couches of the genteel members of society. His first appearance, riding in on a snorting ghost horse during the Savannah Magnolia Festival, shooting the flowers from horseback and cursing up a storm, marked the first time The Reverend was affected by his major weakness, a weakness that led many to eventually abandon the book. Neenan had determined that The Reverend could not touch those who had not been christened, something that Hanland had warned him not to do. The Kentuckian made several appearances, and though The Reverend could never lay a finger on him, he always found a way to collapse a water tower or throw a rope around him. At first, Neenan’s issues sold well, particularly with the youth of larger, Northern cities, an audience that the Reverend had never managed to reach. The Reverend made trips to Chicago, New York, and Los Angeles in his final years as an attempt to increase readership. As sales began to slip, Neenan became desperate, added a crime-fighting group of gorillas called the Apes of Wrath, and eventually resorted to writing “dream” and time-travel issues, in which the established continuity dropped in favor of a sensational cover. The final issues of The Southern Defender went back in time to deal with the Korean War, and The Reverend going with a group of Georgia volunteers to the front. These issues were less successful than those dealing with other conflicts, mostly due to the constant name calling Neenan inflicted on the Korean characters. “Neenan thought that monkeys and war would save him, but the Reverend had run his course.” Reel noted. In the end, Hanland had nothing to do with his beloved character, which had taken a predictable bend under the guidance of Neenan. Hanland had retained the rights to his characters and released his own title, The Holy Father, in 1965. The title failed to attract the audience that had once followed The Reverend, and it only lasted five issues. The Reverend wandered into obscurity, as did its creator. Jacob Neenan took to writing short stories for use in girly magazines, before returning in the 1970s with The Antennae, a comic that launched his filmmaking career with the 1973 release of The Antennae movie. In 1975, Neenan attempted to make a film of The Reverend, but Hanland stopped his bid as soon as he heard of it. Hap retired after letting The Reverend go, started buying land outside of Chicago and selling planned communities. Today he lives in Winnipeg, Manitoba with his fourth wife, Alfa. He still reads comics, and holds the record for most letters of complaint to the various fan magazines, including 17 published in this one alone.